It is a trade fair that will feature the country’s farm and food destinations in line with the government’s sustainable tourism development program. “The overarching goal of our programs and projects is sustainable tourism as we champion the Filipino farmer and the country’s bountiful produce,” says DOT Secretary Bernadette Romulo-Puyat. The event, which originated as Secretary Puyat’s pet project, brings together DOT-accredited farm sites, along with selected travel agencies and thirty local food exhibitors, including organic fruits and vegetables, spices, honey-made products, local artisan chocolates, bamboo tumblers and other local indigenous products. It will also treat visitors to a taste of some of the rare recipes like mushroom chicharon; sili ice cream with tinutong na bigas, caramelado and pili flavors; kakanin, rice cookies, kalamansi jams, pastries using local ingredients; Alavar Sauce and other products of Zamboanga, laing longganisa and Bicol’s other products. Local produce to be featured also include dried seafood, coco sugar, coffee, heirloom rice, chocolate, craft beer, fruit wines, crunchy garlic among others. “We aim to develop sustainable farm tourism as a dependable source of income for Filipinos in line with the implementation of the Farm Tourism Development Act of 2016, which serves as one of our strategies for countryside development,” added Sec. Puyat. 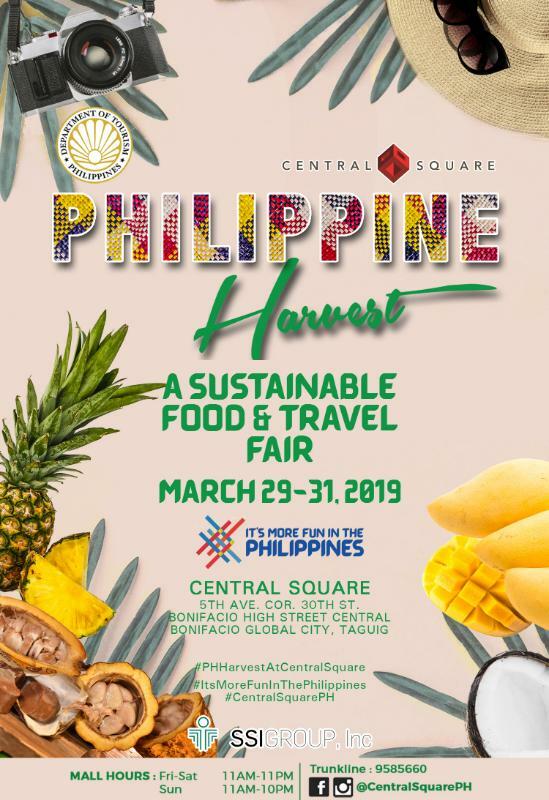 In partnership with Central Square Mall and the Store Specialists Incorporated Group (SSI) , the three-day food and travel expo will feature the following exhibitors: Costales Nature Farm, Santiago Brewery, Teraoka, DA-Region 3, Milea, Kapfer and Rivera, Destileria Limtuaco, Mama Sita, Aging’s Kakanin , Willy Bee, Ritual, Badboy Tikboy, Hiraya Bakery, Coco Natura, Cocotos, Stanford Shaw Ginger Ale, Theo and Philo, Queen Bee Farm, Pinkie’s Farm, Josefina’s Crunchy Garlic, 1st Colonial Grill, C.O.P. Pili Nuts, N.C. Hernandez Food Products, JA Lee’s Farms, Crackle Chips, Chef Rica Dakudao Buenaflor, Casa Simeon/Donsol Eco Tour (Luzon), Smallville (Visayas)/Love Palamuti/Filiology, Cebu Pacific “Juan Effect Project,” SOAP (Spread Organic Agriculture Philippines), Mayumi Organics, The Bamboo Company, Orera Technology, Ayala Foundation, Spectacle Group, Inc., Las Casas Filipinas de Acuzar, CAN property Holdings Ltd. Corp., Alavar Seafood Restaurant, Joyful Garden, B&C Mango Kernels and Auro Chocolate. For more information, please contact DOT at 02-4595200, local 602-607.